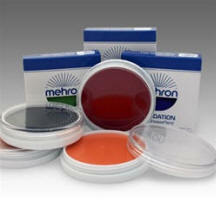 Mehron Professional Liquid Makeup is made from quality FDA approved ingredients. This is the same Professional Liquid Makeup used around the world by performers in television, film & theater for face, body & hair. Glow Yellow, Glow in the Dark.  Fun & easy to use. Consistency in quality & coverage are what makes this Clown White the first choice of professional clowns & mimes. This super smooth, ultra-white cream covers efficiently without dryness or cracking, even under the most demanding performance conditions. Consists of a high concentration of titanium dioxide with the base formulated to a smooth, easy to work with consistency. This super smooth, ultra white cream covers efficiently without dryness or cracking, even under the most demanding performance conditions. An alternative consistency to traditional Clown White. 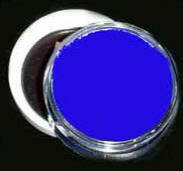 The Clown White Lite formula is based on "European" style Clown White. Greaseless & talc-free, Clown White Lite is vitamin E enriched & contains silicones to create a light weight, firm cream makeup which can be used sparingly while still providing a bright white finish. into creases & folds in the skin. 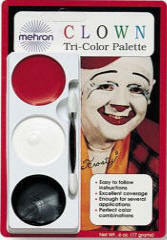 Traditional clown base in a rich, opaque pink shade. Clown Pink is popular among female clowns for creating highlights & a rosy glow. 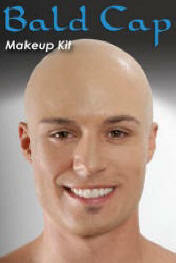 Works well in a make-up air brush gun after being thinned with regular tap water. 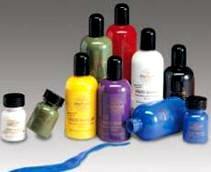 Superior quality, highly pigmented squeeze tubes. 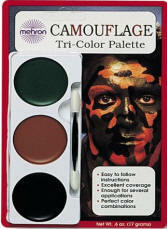 Perfect for Halloween, sporting events or year-round face painting. This size is excellent for carrying small amounts of makeup when "on the go," or, for students beginning the art of clowning. 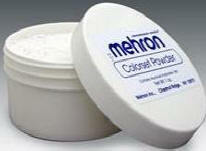 White is Mehron's "Clown White". Made with Professional Performers in mind & used by the Entertainment Industry because it provides an even, smooth coverage that will not crack & is safe to use on your skin. 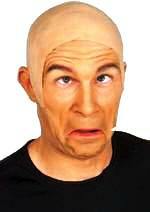 This special castor oil-based formula will not breakdown synthetic prosthetics like other products will. the blue man group look. 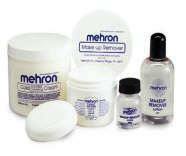 Mehron's Mask Cover is the first choice of professional special effects artists for use on latex, rubber & foam prosthetics. stages & movie sets the world over. that sets cream makeup & prevents discoloring. Apply liberally to a Powder Puff & press the powder into the Makeup to absorb excess moisture; it should be pressed in, not rubbed. When using over a multi color application of Cream Makeup it is advised to work on one color at a time so that colors do not transfer onto each other. Dust off excess with a powder brush. Applies easily with fingertips or with the included brush. 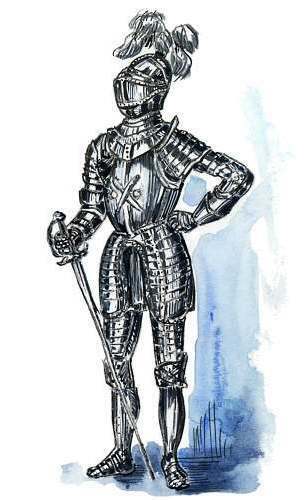 Washes off easily with soap and water. This kit contains enough paint for many applications and the color cups can be refilled with Mehron Fantasy F-X tube makeup. 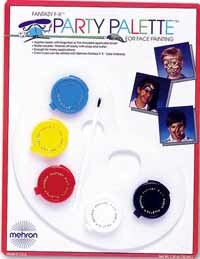 ( see tube makeup below) Kit includes blue, red, yellow, white and black paints, palette and brush. A fine cleansing cream with quick penetration properties for fast removal of cream & greasepaint makeup. The first of it's kind on the market. 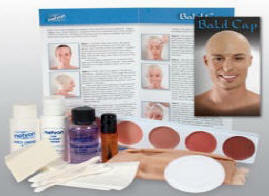 Kit comes with a Professional Flesh Colored Bald Cap, Step-by-Step Instructions, 5 color makeup palette, .125 oz Spirit Gum, 1 oz. Spirit Gum Remover, 1 oz Liquid Latex, .25 oz Colorset Setting Powder, Cotton Tip Applicators, 2 Non Latex Foam Wedge Sponges, 1 Powder Puff Applicator & Make-Up Remover Pads. 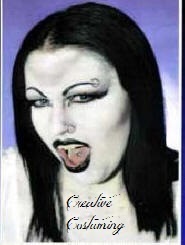 This kit works for Gothic characters as well as Punk, Vampire & a lot of others. Kit includes .25 oz colorset powder, .3 oz cup of jet black shadow liner, tube of black lipstick, 1/2 oz bottle of black nail polish, 4 foam wedge sponges, 1 two inch powder puff applicator, 1 vacuum adhering tongue stud, 2 oz tube of black cream temporary hair color, a .5 oz white color cup make up, 2 hole free piercings, make up remover wipes & full instructions on how to achieve look. face painting, animal & fantasy. Silky smooth, ultra creamy pencils glide on with ease. The premier makeup pencil today, offering unparalleled uniformity & bold color. The premier makeup pencil today, offering unparalleled uniformity & bold color. Silky smooth, ultra creamy pencils glide on with ease.